Each month we eagerly wait for payday. When it finally rolls around, we are first shocked at how little is left after taxes, then we start paying; we pay the landlord, the grocer, the butcher, the petrol station, our kids’ school and so on. All along, our intention is to put whatever is left over into savings but it looks like each side we turn, there is a hand stretched out, demanding to be paid. Soon, there is nothing left over and our savings don’t grow. 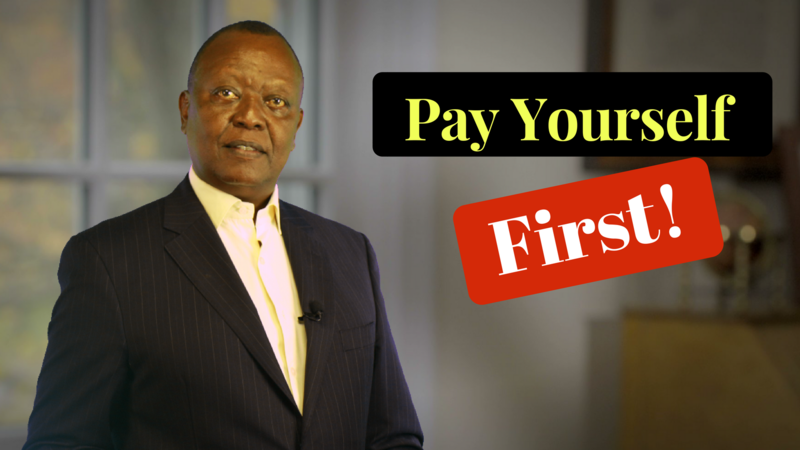 Today we look at how to make our savings grow by paying ourselves first. Please CLICK HERE to watch on You Tube. When we are paying the landlord, the grocer, the butcher, the petrol station, our kids’ school and so on, we basically kiss that money goodbye. We will never see it again. In fact, we are working for those people! Our intention to put whatever is left over into savings is basically unrealistic because our needs and wants always outstrip our resources. So planning to save what is left over is a loser’s game. A better plan would be to pay yourself first. Don’t let the money get into your hands. You might find that you actually begin to grow your savings much quicker this way. If you work for an employer who has an occupational retirement benefit scheme, the first thing you should do is instruct the employer to deduct the maximum you are able to contribute into it directly on the payroll. By default, most people contribute the amount the employer has suggested, usually 5% of basic pay. By not contributing the maximum allowed, people miss out on an opportunity to take maximum advantage of the tax benefit of a registered retirement scheme which allows contributions of up to Sh 20,000 to be deducted from income before tax is calculated. Remember, investment in your registered pension plan is made before taxes. Your investment is larger and with the employers contribution grows quickly. If you are saving for a house, use salary check-off to send up to Sh 4,000 to a home ownership savings scheme. Just like contributions to a pension scheme, contributions to a registered home ownership scheme are deducted from income before income tax is calculated, thereby reducing your income tax. Please CLICK HERE to watch on You Tube. Next have a Unit trust company debit your banking account monthly by bank standing order. This money should into the unit trust funds you have selected as investment vehicles toward specific goals. Bank standing order ensures it happens automatically. Do this for your Sacco savings and any other savings or investments you are doing. After that is done, then figure out how to pay your bills and living expenses. If money is tight, cut back on your living expenses and use the extra money to pay down your debt. Start with the highest interest rate first. Once that debt is paid, take the amount of money you were paying on that debt and add it to the payment on the next highest interest debt. You will be shocked at how much money you will save in interest and how fast you can eliminate debt this way. The idea is to scrimp at the expense of your current lifestyle, while leaving your savings to grow and your debt to shrink. The key is to automate your savings by using salary check-off and bank standing orders to ensure that whatever money you intend to save is removed from your income before you get your hands on it. Once the money you intend to save has been deducted from your income, you then live on what is left. I know many of the people hearing this will scream that this is an impossible plan. However, after the initial period of getting accustomed to living on what is left, it becomes a normal part of your life. It is quite doable with a little will power and the ability to delay gratification for a while. The problem is that if you don’t do this, your future might turn out to be very bleak. But pay yourself first and you will find your savings growing effortlessly. You can thank me later. Please CLICK HERE to watch on You Tube.